She never made it, our Flower Girl. We called her Flower girl and the Italian volunteer Monica called her Vinavil. But regardless of what she was called in the short time we knew her, she felt the love. 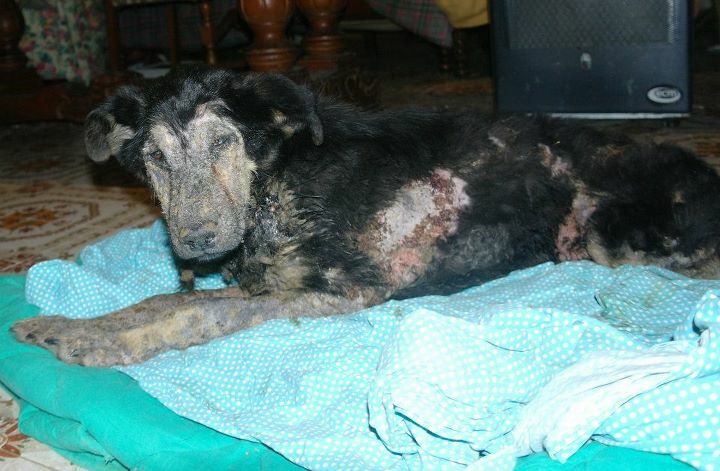 She was found on the street on a cold night, with a terrible skin condition. Probably she had mange and scabies, probably something else as well. Blood was taken for a test, but the results never made it back with the answers before she died. Another volunteer on the street only put Adventix on her! (Like she had any ticks in that condition, and like that would help to heal). Sometimes volunteers with no knowledge can make it worse than better. The volunteer probably would say, “What else could I do?” But in a jungle with all the difficulties the sick animals need veterinarian care. Sometimes, we have to leave animals on the street with their problems, like broken legs, or sick with disease. But with Flower Girl, we had a plan. We got a sponsor Mr Craig Kleber fro LA, for her treatments, and we got the treatment medicine in our hands. But Flower Girl decided to walk to the Rainbow Bridge instead. Many times the wounded and very sick animals may actually stay alive longer on the street, their survival instincts not to be eaten alive and suffer keeping them “on guard” and fighting against what is hurting them. They lay still and await death to take them away. When we “rescue teams” enter the equation and brings them into light, warmth and love, their survival instinct lets down its guard. The disease or injury has free reign and they fall into the eternal sleep with a restful heart and mind. My heart aches and the pain is horribly big. I didn’t get to know her but her soul spoke clearer than anything else. Universe was testing Flower Girl but Universe was testing us who watched and tried to help even more. That’s the Universal Law or That’s Amore! Thank you Monica, Martina, and all you for the donations to Flower Girl. Another stray will get cured with the medicine.